He hands over the command of 101 Area to Major General PK Saini. Lieutenant General DS Ahuja, AVSM, GOC 101 Area relinquished the appointment on 02 Febuary 2019 and proceeded on permanent posting. The General Officer had an illustrious tenure in 101 Area and was responsible for conducting various Operational exercises, Disaster management drills in aid to civil authorities and supervising internal security operations during the Civil unrest situation in Shillong. He also provided an impetus to enhance the civil military co-operation in Shillong. 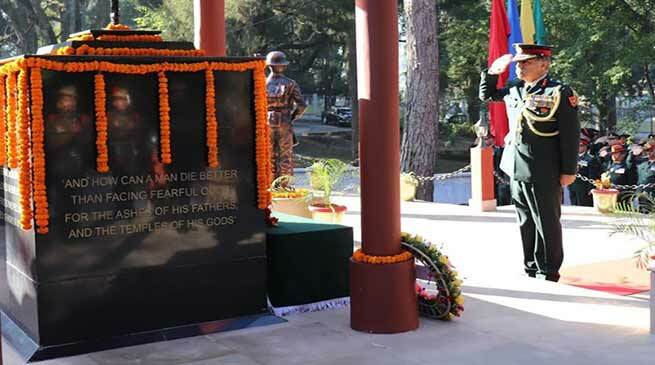 In a solemn and dignified ceremony, conducted on 02 February 2019 at the Rhino War Memorial in Shillong, Lieutenant General DS Ahuja, AVSM, General Officer Commanding 101 Area laid the wreath in honour of the Gallant Heroes of the Indian Army who made the ultimate sacrifice during the war for liberation of Bangladesh in 1971. Headquarters 101 area erstwhile 101 Communication zone holds the unique honour of being the first formation to enter Dacca on 16 December 1971 during the Indo-Pak War of 1971.